This replicated pattern is sized to fit a 30 inch waist / 39 inch hip. This pattern (publisher unknown/possibly syndicated mail order) was originally created by Dec. 30, 1939 and the copyright has expired. This pattern has been re-digitized into it's current format. All content falls under the copyright Vintage Pattern Lending Library 2004/2019, and as such, no portion of this pattern may be photocopied or reproduced by any means without the written consent of Vintage Pattern Lending Library. Our replicated historic patterns are the highest quality available. They are electronically digitized and printed on a high-quality graphics printer in two to three colors. Paper is a beautiful 18lb semi-transparent vellum for ease of pinning and cutting. They are NOT inferior hand drawn, photo-copied or blue-printed replications. Our reproduced patterns are printed on full size sheets - no need for taping multiple small pages, or re-sizing from a small diagram. Our patterns include seam allowances, grain lines and updated text for ease of construction. Patterns are reproduced directly from the original source material, with no changes in order to retain the historical accuracy of the pattern. Prior sewing experience and knowledge of working with vintage patterns is recommended. 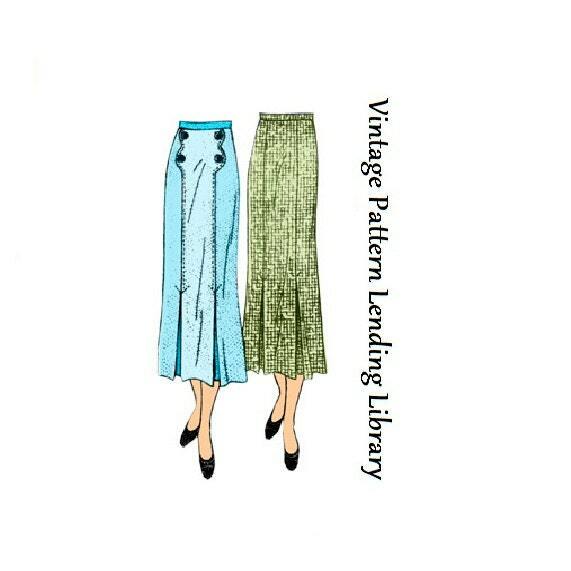 Since 1998, VINTAGE PATTERN LENDING LIBRARY has been the 'go to' source for vintage sewing pattern reproductions. We accept 100% returns on any patterns you are not happy with. Please visit us at www.vpll.org to learn more about our preservation projects. This seller packages her patterns very nicely, and the items always arrive in a timely manner. I'm so excited to work with this pattern. Beautifully printed with seam allowances, notches, and grain lines; as well as clear instructions and the yardage required. And it was gorgeously packaged and arrived very quickly! Thank you! Shipping was very quick, good product. Thank you! Beautifully packaged! Can’t wait to make it. All payments should be made within 3 business days of purchase. If you need more time, or if an issue has arisen, please contact me as I'm sure we can work something out. Credit Cards, Etsy Gift Cards and PayPal are accepted. I truly want you to be happy with your purchase. A full refund will be issued if you feel item is not as described. Please contact me upon delivery to let me know of any issues. Return shipping is the responsibility of the buyer and item refund will be made upon receipt of return. Single patterns are shipped via USPS 1st Class Mail. When purchasing more than one pattern, due to weight restrictions, they are shipped via USPS Priority Mail. Every effort is made to ship within one business day of your cleared payment. A tracking number will be provided on all domestic shipments to check status of delivery. I apologize for the USPS International pricing increase. These are not my fees but are determined by the postal system. Effective January 21, 2018, patterns previously sent at a lower "envelope" rate are now required to be sent at the "package" rate which is almost double the price. Only documents without a value may be sent at the envelope rate - patterns do not qualify. Tracking will still be provided for your parcel, however, once shipped, I cannot be accountable for delivery times and delays at your local customs office, nor am I responsible for your local taxes/VAT fees. 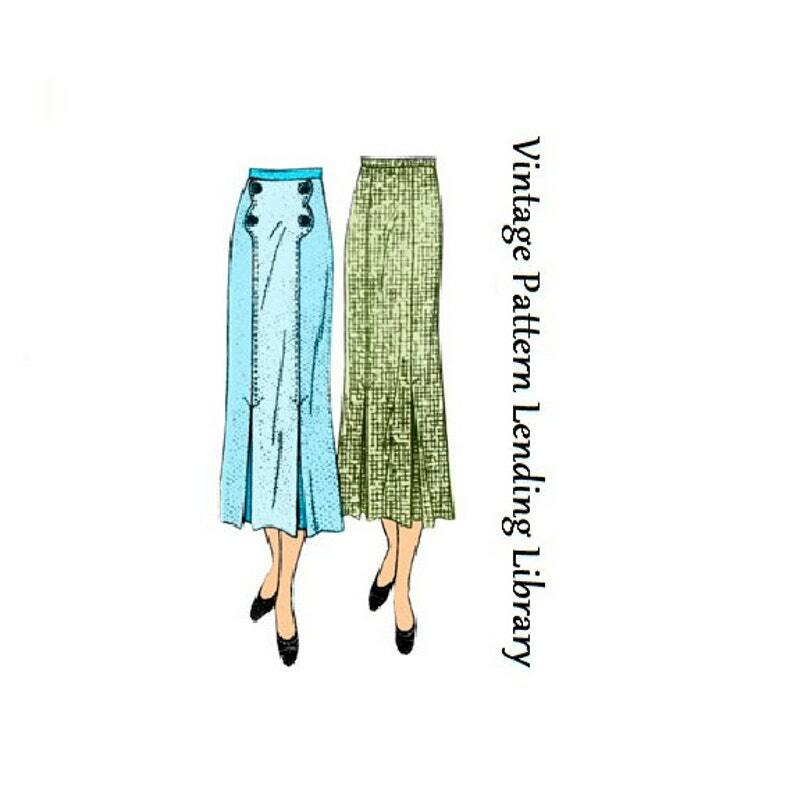 Although Etsy is a new venue for us, the Vintage Pattern Lending Library has been in business since 1998. Purchase with confidence!